Declaring "the manner of my end is sweet to me." 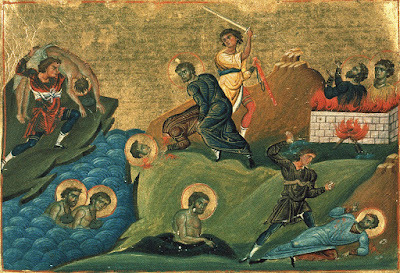 After Emperor Maximian called for a persecution of the Christians of Nicomedia following his return from a victorious campaign in Ethiopia, and the Christians refusal to participate in the imperially decreed sacrifices to the lifeless idols of all Roman citizens, the wise and fearless priest Glykerios openly addressed the emperor, saying among other things: "You boast of your triumphs over hordes of your enemies, but we who are small in number shall overcome with the help of the great God whose power you ought to have observed, O senseless and stone-like man, especially after those fearsome signs. Have you forgotten the terrifying thunder, lightning and hail, followed by the deaths of so many subjects and the ruin of the crops? These things took place on account of the blasphemies you pronounced. Therefore, entertain no hope in converting us. We fear not your threats." When the boastful tyrant heard these words, he gave up hope of changing the beliefs of the Christians. Instead, he grew even more enraged, and viewed Glykerios as a rude man who insulted his authority. For this reason, he ordered his men to have Glykerios bound and brought before his tribunal. Then he was mercilessly scourged until the torturers fell from exhaustion. Glykerios remained silent through the ordeal, entreating the Lord to help him endure the torments that he may receive recompense in heavenly rewards. When the emperor heard this, he ordered him to be flagellated even more, so that it seemed Glykerios was without breath and the floor was covered in his blood, leaving his bones exposed. Even the spectators were moved to pity the priest, bringing shame on those who dispensed the torture. When Glykerios glorified Christ after all this, the emperor ordered that he be taken outside the city and consigned to the flames. After he prayed and thanked Christ for making him worthy of a martyric end, he was cast into the flames as an acceptable whole burnt offering to the Lord.